First Regional Meeting of Women from the Network Protection of Magdalena Medio. Since 2013, Protection International and Pensamiento y Acción Social (PAS)—PD COL— have been driving a networking strategy with five rural communities in the region of Magdalena Medio, which are affected by high levels of risk resulting from land tenure disputes. As a part of the networking with these communities, it was held in the city of Barrancabermeja on July, 31 and the first of August the First Regional Meeting of Women from the Network Protection of Magdalena Medio. The meeting aimed to provide a specific space for women who are actively involved in community processes for the defense of the right to land and who face specific risks in resistance and fight for land processes. The workshop, which was facilitated by an expert in working with women and activists, proposed a methodology aimed at analyzing the relation between body, territory and autonomy of women. 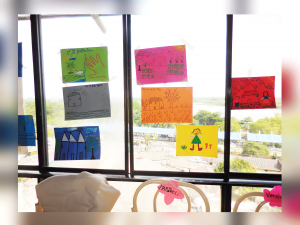 Through a series of relaxation exercises and artistic activities, participants had the opportunity to reconnect with their own bodies and to identify the emotional impacts arising from the stories and experiences that leave a trace on the body. In addition, the meeting provided a rewarding opportunity to work on the role of women in the defence of the territory and to share experiences on the challenges of combining their roles and responsibilities in the domestic sphere with their participation in the process of defending the right of their communities. Finally, it was discussed the relation between body and territory from the point of view of protection need, pointing out the importance of recognizing, caring and protecting the body itself in the same way as in defending the Earth. Proposals on how to strengthen women’s autonomy in the territory and in the protection and defence of the territory were made. For more information about the activities carried out by PI in Colombia, please click here.